Colquhoun writes exuberantly about the oil resources of the country, as well as its jade, gold, copper and coal. There are dense forested hills of teak, unspoiled fisheries and fertile valleys. Nor did he forget the potential for reopening old trade routes connecting China and India. The thing is, he wrote about all this in 1885. But Colquhoun was right. By the 1920s, Burma was a regional hub and relatively rich. But after those prewar peaks, Myanmar suffered through a long period of decline and isolation, nurtured by an oppressive government. 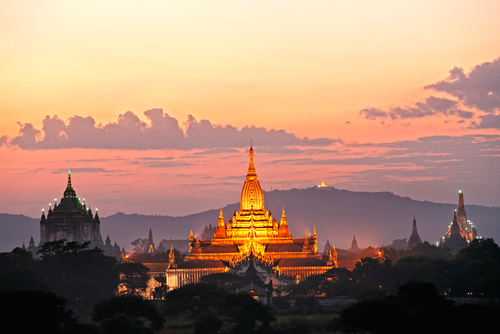 Today, Myanmar is again in the news as it reforms and opens up to the world outside. It is a market of 60 million people poised to join the global economy. It is a large country, bigger than France, with rich stores of natural resources and much untapped potential. Fertilizer use is 43 times greater in Thailand than in Myanmar. As you can see from just this partial list, there are opportunities in tourism, hotels, power generation, cars, mobile phones, health care and agriculture. Myanmar is like a market frozen in time. But things are changing. As I write, the government is still hammering away at a new investment law that will open things up and make the rules of the game clearer. The biggest source of foreign investment right now is oil and gas. Natural gas is Myanmar’s biggest export. (It supplies Thailand with 21% of its natural gas.) Yet the value of Myanmar’s total exports runs to only $9 billion. Compare that with Thailand’s total of $225 billion. There is plenty to do on the oil and gas front. Myanmar is actually one of the oldest oil producers in the world. The country exported its first barrels back in 1853. So rich is the soil of [Burma] that it has only to be scratched to burst into plenty… The southwest monsoon, commencing in early June, soon reduces the ground to a soft sea of mud. Even today, most people in Myanmar work on farms growing over 60 different crops, including wheat, beans, rubber, sugar and oilseeds. Beyond this, Myanmar has over 1,800 miles of coastline. Beautiful beaches lay almost untouched by human feet. A few developments have just broken ground. (And I had to smile at the quaint regulations, such as one that requires no building be taller than the coconut trees.) There are over 800 unexplored islands in the Andaman Sea. The country is a significant source of fresh fish and shellfish. It is also one of the largest sources of hardwood in the world. Real estate is a big opportunity. Hotels, I’ve mentioned. But there has been virtually no development of any kind in Yangon (the old Rangoon). Gisbourne notes that one large shopping center in Bangkok has more retail space than all of Yangon — a city of 4 million people! Similarly, one office building on Sathorn Road in Bangkok has more space than the whole of Yangon. As the economy develops, the demand for things like hotels and office space and shopping centers will increase manyfold over what exists now. So will the demand for railways and highways, pipelines and refineries, cell towers and power plants. Anyway, Lewis’ book came out in the 1950s. He wrote glowingly about Burma’s prospects. Yet a military coup lay less than 10 years in the future, which would send Burma on a near 50-year journey in darkness. So you never know. Nonetheless, the best time to get interested in places like this is when they just start to open up. That time is now. My hunch is that Archibald Colquhoun’s 1885 thesis is back in play. Burma, now Myanmar, is the best unopened market in the world.